Max is nearly 12 years old and he lives with his mother. As it's the school holidays she has given Max a Dictaphone in which he records everything that happens to him that summer. It has always just been Max and his mother and they have their own little routines he is content with, but all that changes when he comes to fix the boiler and asks Max's mother out on a date. From that moment on he becomes a part of Max's life, and not in a good way. Max is no longer the centre of his mother's attention and the new boyfriend is being unkind towards him. Max is unable to talk to his mother about is, so instead he shares his thoughts and feelings with his Dictaphone and the old lady across the street. Minnie lives in the big house in the middle of the estate on which Max lives. When Minnie was Max's age the entire estate belonged to her family, and back then the neat rows of houses were fields and tennis courts. Even though the world around her has changed tremendously in the decades that have passed, inside the house time has stand still. Minnie and her older sister Clara live among the antiques of their youth, stuck in their routines and afraid to leave in fear that the world will uncover their secrets. But as Minnie notices the boy across the street recording his days, she decides to do the same. She picks up a diary from when she was much younger and finally tells the tragic story that led to herself and her sister living in solitude for so many decades. The Comfort of Others is anything but a comfortable read. The man entering Max's life as well as Minnie's mother were two characters whose actions made me feel hugely uncomfortable while reading and on more than one occasion I contemplated putting the book down as I didn't want to discover what terrible things the two main character would have to deal with next. Despite the adversities on their paths, however, I found Max and Minnie two very compelling characters and it was their unlikely friendship that kept me hooked on reading this novel until the very end. Max narrating his days in his Dictaphone and Minnie in her diary created an instant personal connection to these two unlikely protagonists, and when their paths crossed they had each other to confide in which made them both stronger and able to tackle the challenges in their life – proving how valuable it can be to talk about problems and worries. The novel as a whole almost felt as an intimate look into the psyche of these two people and while not everything we discovered, especially the horrifying events from Minnie's childhood, made for cheerful reading it was certainly engrossing. While I was gripped by Max and Minnie's friendship and the uncovering of secrets past and present, the ending of this book let it down for me somewhat as it came too abruptly and happily-ever-after, which felt improbable after the events preceding it. Perhaps adding the same gentle touch of storytelling to the conclusion as had been applied to the other pages would've been a better choice here. Despite its ending, however, the entwinement of the cross-generation stories and secrets made for a fascinating read. The Comfort of Others is a quiet novel about discomfort and oppression, and an unlikely friendship defying them both. 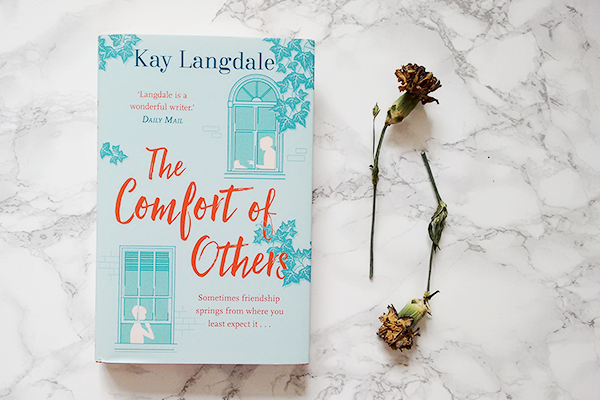 The Comfort of Others is published by Hodder & Stoughton and you can buy the novel from Foyles or your own preferred retailer.